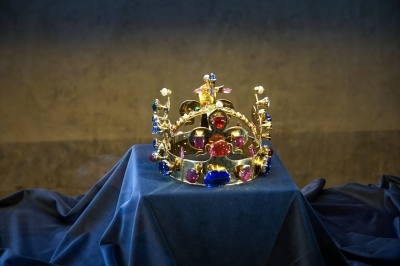 What does it mean that Jesus is a king? To answer this question, I want to start us out by considering 3 differences between a president and a king. We have a pretty good idea of what a president is and it’s easy for us to get our heads around what that means, but we are not as familiar with what a king is. And there are some key differences between a president and a king that highlight why Jesus is so important to us. A. A president is voted on, and a king is born. What this means is that anyone can be president. But only someone from noble birth can become king. The idea behind this is that there is something special about the family line of a king. That they are inherently noble, inherently good, inherently stronger, better and wiser. Now for man… we know this isn’t necessarily true. Just because someone is the son of king, doesn’t mean they are inherently anything except rich and pampered. But for Jesus this absolutely is true. Because Jesus is the son of God. “But you,” he asked them, “who do you say that I am?” 16 Simon Peter answered, “You are the Messiah, the Son of the living God.” 17 Jesus responded, “Blessed are you, Simon son of Jonah, because flesh and blood did not reveal this to you, but my Father in heaven. So, simply because of who Jesus is, The Son of God, it means that He does have some very important inherent qualities… He is inherently all powerful, He is inherently all wise, He is inherently all good, He is inherently truth. So, Jesus is King because He is the Son of God and that means that He is inherently the only one fit to be the King of Kings and the Lord of Lords. B. A president is held in checks and balances, a king is supreme. When this country was founded, the founding fathers understood the shortcomings of man. They had witnessed what happens when one MAN holds all the power without any checks and balances, so they put into place a system, that meant no ONE PERSON or ONE GROUP of people ever held all of the power. They put in a system of checks and balances because man is flawed. However, Jesus is absolutely perfect. And therefore, needs no checks and balances. We know from John 14:6 that Jesus is The Way, The Truth and the Life. And the one we want to focus on here is The Truth. This is one of those qualities of Jesus, that I wish we could really get our heads around. Because this doesn’t say that Jesus preaches truth. It doesn’t mean that Jesus knows truth. It doesn’t mean that Jesus understands truth. It means that He IS truth. Everything about Him is truth. In other words, if Jesus ever said anything that wasn’t truth it would immediately become truth. The truth of the world is controlled by Him, he is not controlled by the truth of the world. C. A president’s time is limited and a king is king until he dies or is defeated. So it is good that Jesus is a king because Jesus will never be defeated. So, we as his people will always live under an undefeated king. Meaning we are perfectly protected. It is also good for Jesus to be king forever because there is no one more suited to being our king than Jesus. Who better to be our king for eternity than the one who we were created through and created for? There is no one better than Jesus. The fact that Jesus will be our king forever wipes out all uncertainty for our eternal lives. We will always be ruled by a completely benevolent and perfect God. So, those are 3 key differences between a president and a king and three reasons why Jesus is king. Jesus is King because of Who He is… He is the Son of God. Jesus is King because He is eternal and will be undefeated forever. There is a movie called A Knights Tale. And this movie is about a young man who was born into a poor family. Meaning that he would never have a chance to be knight or to be royalty. But the thing is, when he was older he pretended to be a knight born of a royal line, so that he was able to participate in jousts and competitions that were meant only for knights. To make a long story short, one day he was found out and he was thrown into the stockade. But during his time pretending to be a knight he found favor with the prince. And so, the prince came up and released the young man out of the stocks. He then told everyone looking on that his (the prince) historians determined that the young man was of noble birth. And therefore, he knighted him right then and there. Now of course he wasn’t of noble birth but here is what the prince said “This is my word, and as such is beyond contestation.” In other words, just because it was the prince who said he was of noble birth, it became truth. And no one could argue it. And here is why this is important to us. We are not of noble birth. We are born in sin. However, when we believe in Jesus…and when we ask for forgiveness…We become the children of God… we are then born into nobility. No one can argue it. If you believe in Jesus and you confess your sins to him, then no one can argue that you aren’t a child of God. No one can argue you aren’t forgiven. This is Jesus’ word and since he IS truth therefore it becomes truth. I think sometimes we refuse to believe that we are forgiven. We hold ourselves hostage to our own sinful pasts. We beat ourselves up, we hold ourselves back from enjoying the freedom that comes with forgiveness. I think sometimes we live in doubt that we are children of God. And we live with a mindset where we are continually trying to earn his love. Or we live in doubt that he could love someone like us. But this is not up for debate. He absolutely can and does love us and we are his children. On Christmas, we celebrate the birth of a King. We celebrate the birth of Jesus. And the reason we this is such a big deal for us is because of what it means for us. If we believe in Jesus, we are His people and if we ask for forgiveness we are forgiven. This is His word and as such is beyond contestation. My question for you… Are you trying to contest God’s word or have you accepted the fact that you ARE FORGIVEN and you ARE A CHILD OF GOD?